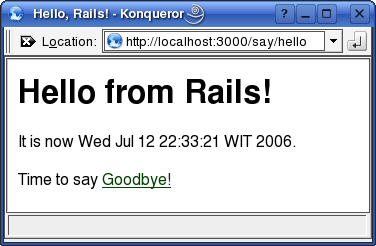 Several days ago, I finished install Rails on my system. At that time, I didn’t have anything to show you about the easiness of Rails. In this occasion I will show you how easy it is to create a simple web-based application. The application will just display “hello” and “goodbye”. During my adventure to install Ruby on Rails, I didn’t find a detailed guide explaining the process, what component should be install first, etc. So here is my note regarding Ruby on Rails installation using gem. Please note that I install the components using gem local installation.